The new DG-3 portable digital microscope, features a large 3.5 in. LCD, calibratable measurement bars, image preview mode which saves disk space, and 2x button to insure a good focus. The 3.5 inch LCD makes viewing much easier, measurement (micron) bars can be calibrated for each lens and imbedded in the image, the preview mode allows the viewer to discard images before they are burned to the removable CF memory card, and its new 2x button allows for immediate digital magnification of the image. The DG-3 has optional lenses from 25x to 1000x. The premier lens would be the 25x to 200x parfocal zoom lens which makes it easy to magnify the exact item you would like to view in a broad range of magnifications. The strength of the DG-3 Portable Digital Microscope is its extreme portability. It can be used in the field, in the factory, in a fuselage, on animals, pipes, PCB's, and nearly any material requiring quality control or non-destructive testing. 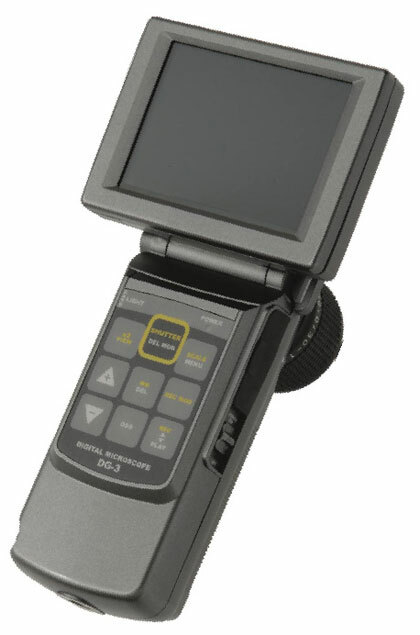 The DG-3 Digital Microscope features a 3.5-inch LCD panel for easy viewing as well as measurement (micron) bars, which can be calibrated for each lens and embedded in the image. Preview mode allows the viewer to discard images before they are burned to the onboard memory card. In addition, a 2X button offers immediate digital magnification. Optional lenses cover a magnification range from 25X to 1,000X. 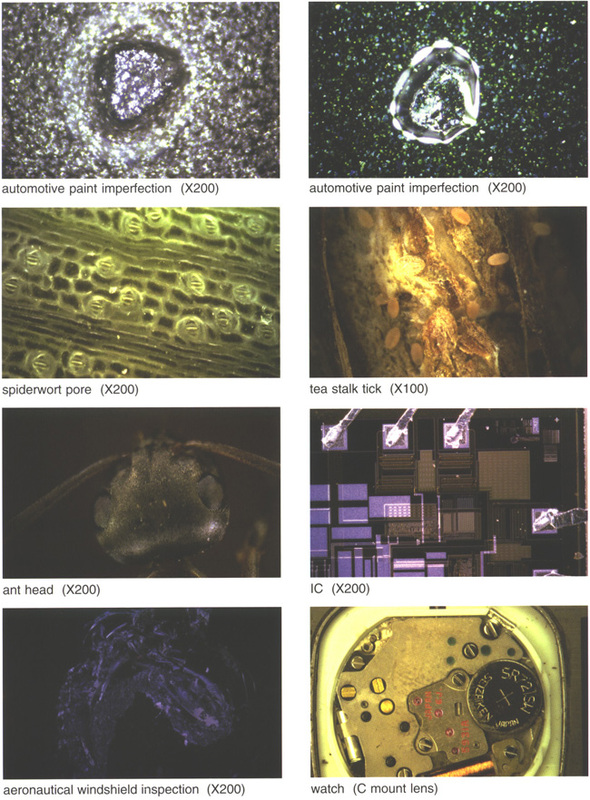 These features make the portable microscope valuable for quality control (QC) applications. For example, it can capture a stress crack before it ruptures and, of course, documentation is a critical part of QC. Also, this portable instrument serves as a microscope, digital camera and monitor, all in one. And, because it is digital, images can be sent via e-mail. 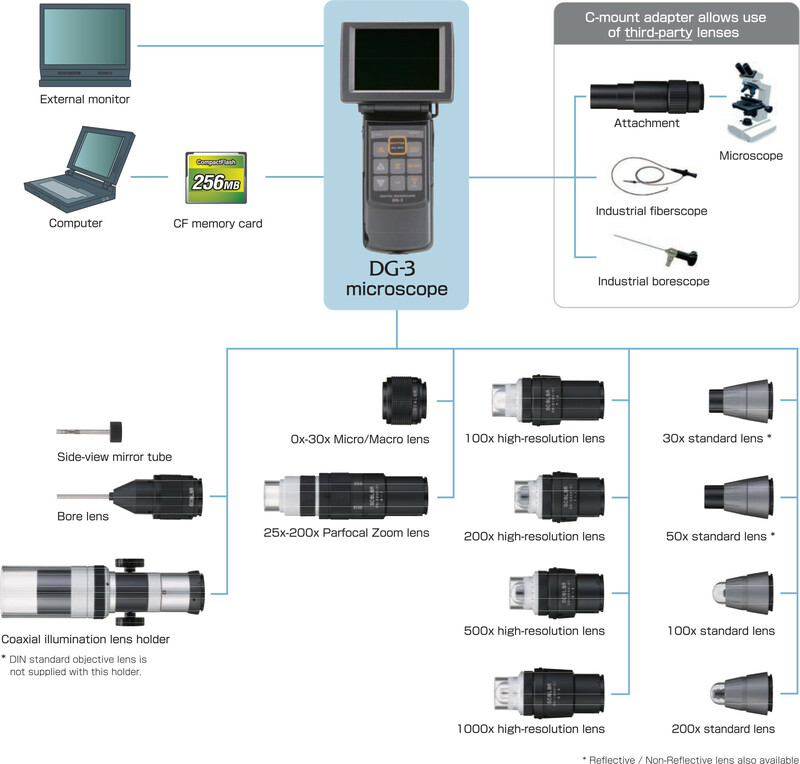 The DG-3 is a 2.3-megapixel (Mp) microscope that offers portability to meet applications in the factory or the field. It is powered by a lithium ion battery for 1.5 hours of continual use; the battery recharges in the same amount of time. Images are saved to a memory card, which holds 580 images in Normal mode and 310 images in Fine mode. All images are high-resolution JPEGs. The 2.3MP high-resolution CCD Increases the accuracy at analysis gathered from observations in the field for research and development applications. With its brilliant monitor, the image quality is truly state of the art. The DG-3x is light and compact. At a mare 490g, it is the lightest self-contained portable microscope in the world. Its lithium-lon battery provides for I.5 hours continuous use. An A-C adapter comes in standard for extended In-house use. Recording is as easy as bringing the lens Into contact with the subject Subjects that defy transportation, disassembly, removal or processing can thus be digitally captured for subsequent analysis. A CF card stores recorded JPEG images for subsequent transfer to computers, printers and other external devices. Enhance your reports with striking images when text alone will not suffice. The DG-3x has two functions which will help anyone produce perfectly focused images. It has a 2x button that will help you to check for clarity of the Image pr1or to capturing it as well as a digital focus bar that indicates the sharpness of the images. The monitor displays scale and magnification. These values may be recorded on the Image to preserve your findings. A wide variety of lenses with different magnification and illumination features make it possible to build an observation system that is perfectly tailored to specific imaging needs. The microscope is C-mount compatible in order to accept e broad range of C-mount lenses, endoscopes and microscopes. We also provide a variety of stands to help insure you get just the right image.